Still life / Patricia Pollett, viola. Flux : for violoncello solo / Stephen Cronin. Flux : for viola solo / Stephen Cronin. 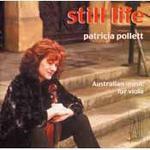 Flux was written for Patricia Pollett in 1995. The piece grew out of a joke where I kept teasing Patricia that I intended to write a piece that used only harmonics. As time passed and I mulled over musical possibilities, the harmonics idea firmed and eventually became reality. Flux comprises two sections, 'Strophe' and 'Antistrophe', which may be played continuously or separately. Where the 'Strophe' is still and ethereal, the 'Antistrophe' is animated and earthbound using a wide variety of timbral techniques. Flux has a companion piece, Breathe, which also uses only harmonics. That piece was drawn from an idea at the opening of Ravel's Soupir. Contents note: 1. Strophe --- 2. Antistrophe.